In September 1939 the author Stanislaw Swianiewicz was an officer in the Polish Army. He was captured by the invading Red Army and sent along with thousands of other Polish officers to prison camps in the Soviet Union. He narrowly avoided the fate of his fellow officers in the Katyn massacre by being summoned to Moscow by Beria, head of the Soviet secret police, for interrogation on suspicion of being a Polish spy in Germany before the war. The book was originally published in Polish in 1976, translated and published in Russian in 1989, and translated by his son Witold Swianiewicz and published in English in 2002. ...concerned with my experiences as one who participated in the Polish campaign of 1939; then, as a prisoner in Kozelsk, in Lubyanka, in Butyrki, in the Soviet concentration camps, and after my release, as a resident of the Polish Embassy of Kuybyshev and as a person who happened to come into contact with the key problems of the Polish Government in London, during the last stages of the Second World War. 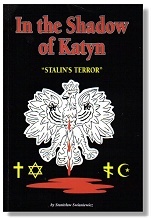 Professor Stanislaw Swianiewicz, who has died aged 97, was the only intended victim to escape the Katyn massacre, in which 4,300 Polish officers were murdered by the Soviet secret police in April 1940...In his memoirs In the Shadow of Katyn he reflected on Russia's attempts to crush Poland. ...the fate was tragic for the multitudes that were ruthlessly disarmed by the Soviet Army, which unexpectedly crossed the eastern borders of Poland on September 17...The author relates how 17,000 officers were promptly imprisoned at three large camps...No one knew then that on March 15, 1940, Lavrenti Beria sent an urgent memorandum to Stalin which stated that all these "hardened and uncompromising enemies" of the Soviet authority must be declared guilty and executed....The narrative demonstrates his keen understanding of history, and the lucid style makes this book easy to read.